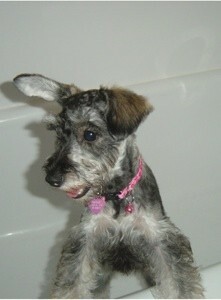 Trixie is a 2 year old Schnoodle. I needed a companion for my dog, Yogi. I got Trixie when she was 6 months old. She likes to run and jump. Trixie is a great little runner and leaper. She would be fantastic at an agility course. She loves everyone, literally. She also has the most expressive ears I've ever seen on a dog. They're like little antennae. I love Schnoodles! We were lucky enough to be blessed with ours. Boogie, for 9 years. He passed away 2 years ago and we still miss his little soft body in our arms. Hope you win the contest!